Help!… I have a crockpot. I know I should be using it to cook more efficiently for my family. But I just don’t feel motivated to use it. What do you think might motivate me to return to crockpot cooking? It’s amazing to me that not more people use their crock pots because there are so many advantages to using one, and so few disadvantages — if any. Crockpots (or slow cookers) have been around since our grandmother’s time and our grandmothers utilized theirs often. In fact, that is how many of our grandmothers and mothers were able to create home-cooked meals and still get everything else done around the house or on the job. I personally love my crockpot and use it at least 2 or 3 times per week. As a freelance writer who works from home, using my crock pot makes it possible for me to be able to stay at home and eat healthy, rather than eat all those convenience foods which aren’t so good for you. 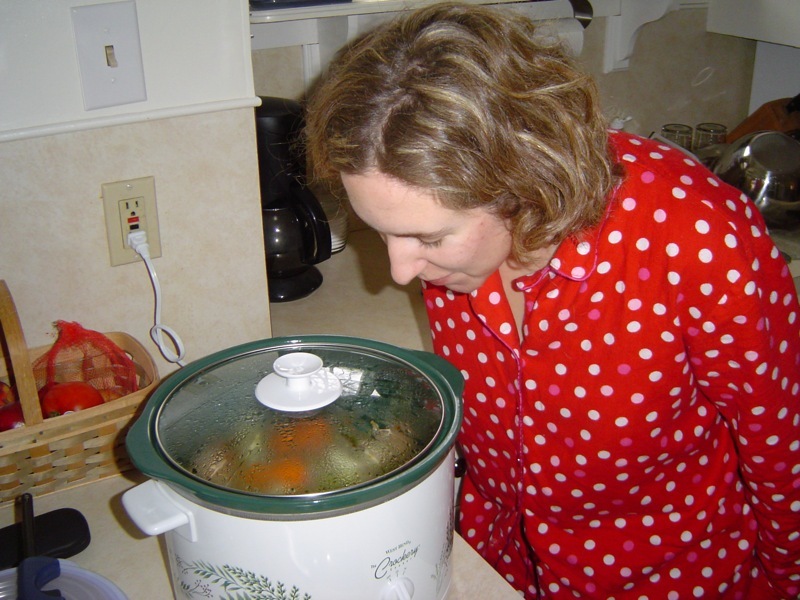 #1 Crockpots save energy — if you use electricity to cook. A crockpot uses far less electricity to cook a roast than an oven does. 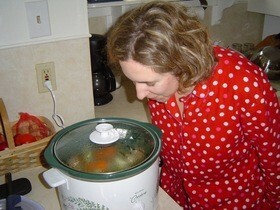 #2 When using a crockpot, you can go and do other things while your food cooks. One of the best things about a crock pot is that it doesn’t require watching or stirring of food. In fact, it is not recommended that you lift the lid once a crockpot has started cooking, because it allows the heat to escape and thus slows down cooking time. #3 You can buy less expensive cuts of meat that would be tougher to chew if you cooked them on the stove or in your oven. The act of slowly cooking meat in a crockpot effectively softens even the toughest meats. So, in this way, a crock pot can also save you money. #4 There is less chance of scorching or burning your food because of the low temperatures that a crockpot uses to cook. 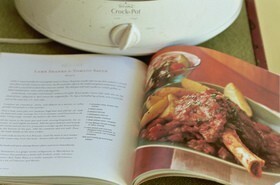 #5 Using a crockpot frees up your oven and stovetop for other types of cooking or baking that you might like to do. This can be especially useful during the holidays, when you are cooking for a crowd and every bit of extra cooking space helps! #6 Unlike ovens and even stovetops, crockpots will not heat up your kitchen. While it may be nice during the winter to have that little extra blast of heat, it can be an altogether different story in the spring and summer. Most people avoid turning on the oven during the summer months for the very reason that it gets too hot in the kitchen. Cooking with a crock pot avoids this dilemma and makes it possible for you to have many of your favorite normally oven-cooked meals. #7 Crockpot meals are lower in fat, due to the fact that the foods cook in their own juices. Plus, it’s not necessary to add much butter or oil — if any. #8 The steaming, covered environment of a crockpot allows for more food bacteria to be destroyed than is the case with more traditional methods of cooking. #9 Foods cooked in crockpots retain much more of their vitamins and minerals than do foods that are fried or boiled. This is because of the fact that they are cooked for such a long time at such a low temperature. #10 If you aren’t sure what to make in your crockpot besides roast or soup, there are literally thousands of crockpot recipes online to choose from. You can make something as mundane as meatloaf, or something as tasty as bread pudding in your crockpot. With a little help from the Internet and your computer (not to mention cookbooks from the library), the number of crockpot recipes are virtually endless! These are just a few of the many reasons why cooking with a crockpot makes sense. If you aren’t cooking with a crock pot then you are definitely losing out. From personal experience, I think that food cooked in a crockpot is more flavorful and robust than food cooked in the oven or on the stovetop — which can often have an overcooked or cooked-to-death taste.